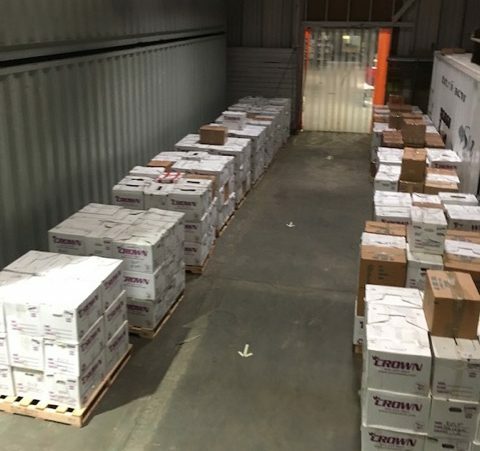 It’s the 4th of July and we’re celebrating in Richmond, California where we just finished repacking and sorting the legendary KUSF archive – 22 pallets full, maybe 60,000 (whose counting?) discs. This collection was transferred in 2012, and it is now ready for its next stage. We are finding the recordings are in good condition considering the heavy radio play. The normal surprise are the prominent call letters markings on most of the cover art. The pop 78s are being prepped to be digitized as part of the Great 78 Project and the remaining 45s, classical 78s and LP’s physically preserved to be ready for the next stages of digitization and access. KUSF was a non-commercial radio station owned by the University of San Francisco. From 1963 until 2011, the station broadcast at 90.3 FM MHz. KUSF currently broadcasts online and is still a student driven organization at the University of San Francisco. Hip and popular, the station was student run, freeform and eclectic. Many now-famous acts first gained exposure on KUSF, including The B-52’s and Metallica. We’re doing our best to keep these gone but important cultural icons alive. Wow, this is serious digitizing! Internet Archive always manages to push reality beyond dreams. What a project…you are doing an outstanding job! Robert Crumb has a huge collection of 78’s. He should add digital copies to your archives. Also copies of all his art. Yes, IA is doing more than anyone else in helping to preserve our cultural heritage, AND would love to have a contact for Mr. Crumb! I was introduced to your web site and I am so glad to see historical publications archived! I am the Camp Historian at Camp Etna, Maine, a Spiritualist camp begun in 1858 and established in 1876. I have been scanning programs and documents we have in the museum I have created and uploading them to Facebook, but would love to upload them to archive.org. Can anyone help me do this?